Business leaders must spend more time thinking about the future. To help make this a habit, I have developed the “Future 15”–a policy of taking 15 minutes once a week to think about the future. To make the habit simple, I encourage business leaders to follow the 6 “F’s”: Every Friday at Four Forty-Five (4:45 pm) set aside Fifteen minutes to Focus on the Future. To make the habit even more straightforward, posted below are Fifteen articles. Select one article and think about what it means for you, your business, your business model, or your customers. Think: McKinsey’s Three Horizons Model for Innovation No Longer Applies. Here is Why. The world is changing so fast that business leaders need to rethink how they think about innovation. Think Different: This light-powered 3D printer materializes objects all at once. If you are in the manufacturing business, it is time to begin thinking differently about how you can manufacture certain objects. Think Smarter: How Freelancers Are Refining “Talent” for HR People. If you want to be fast, agile, and adaptable, you may need to rethink your HR strategy. Think Harder: European Union Recalls Smartwatches. The future of wearable technology is not preordained. This article explains why. If you are thinking of buying a smartwatch or using wearable technology in your business, you may want to think harder. Think Like a Child: The Beauty of a Beginner’s Mind. What to think like a child? Try to practice the “don’t know” mindset. It might lead to the wisdom of uncertainty. Think in Questions: Do You Keep a Failure Resume? It is a great question, and you might want to think about starting one. Think 10X: Self Healing Coating Protects Metal From Corrosion. The number of “structurally deficient” bridges in the United States is astounding. This technology could help address this serious issue, especially if the technology gets 10X better or 10X more affordable. Think Bigger: The Most Exciting Facial Recognition Use Cases in Business. Facial recognition can reduce “friction” in some customer interactions. You may need to begin thinker bigger about the potential applications of facial recognition in your business. Think Faster: The Five Promises of Micromobility. The future of transportation is changing fast. You will need to think faster. (Great photos). Think Radically: Self Driving Cars Will Never Be Moral. Many people dislike self-driving cars because they don’t believe the vehicles can make split-second, life-and-death decisions. This is true, but it assumes that humans can. Is this assumption correct? Think Again: The World Might Actually Run Out of People. Think the world’s population can only increase? Think again. Think Sustainably: The last five years have been the warmest since records began. If you need another reason to think about sustainability, look no further. Think the Unthinkable: VW Floats Opening Up EV Platform to Competitors. Why would a company give away its best technology to its competitors? Maybe because the world is changing. Want to think again? 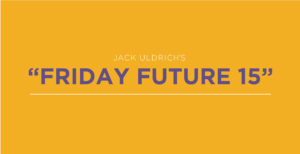 You can always revisit last week’s “Future 15”.